By the end of the 1800’s the tide was turning in the white fishing industry. The perils and dangers of working from small boats from primitive harbours and the subsequent loss of life was one influential factor that was turning the younger population away from the industry and the coastal villages, but perhaps more significantly the arrival of the trawler and deep sea fishing was a more influential factor. Soon a vessel was built which was specially designed for trawling. This was the North Star, built and launched in Aberdeen in September 1883. In less than eight years she had landed over £46000 worth of fish. The trawling revolution was well under way and the death bell was tolling in respect to the line fishing and the small coastal villages that relied on that form of fishing to make a living. The introduction of steam power to the fishing industry was the catalyst that doomed the old methods and ways of life. Initially steam was used merely to power the capstan for pulling the nets however it later replaced the sail as well. The small village boats with their oars and occasional sails were being consigned to the history books, although remarkably a few of them clung to life into the 1900’s. Steam transformed fishing from craft industry to modern industry, and encouraged growth and development in major ports. 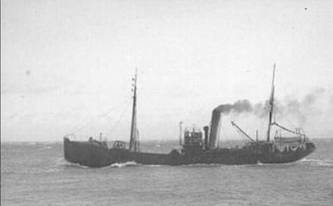 Trawlers became the norm, and the great distant water trawler fleets from Aberdeen and Peterhead, owned by fishing companies and worked by hired deckhands, were soon established. These new, highly capitalised methods were not welcome everywhere. Tradition dictated that white fish should only be taken by hook and line; since vessels catching white fish in other ways threatened the survival of whole communities these vessels sometimes found themselves being pelted by stones if they tried to land their catch at “tradition-bound” harbours. So strong was the feeling over this, and so deep the roots of semi-pagan folk beliefs in the fisher towns, that effigies of “the capitalists” who threatened tradition and communal survival were burnt in a number of villages. I don’t believe that this occurred in any of our villages, who appeared to be resigned to their fate as modern developments turned into reality. 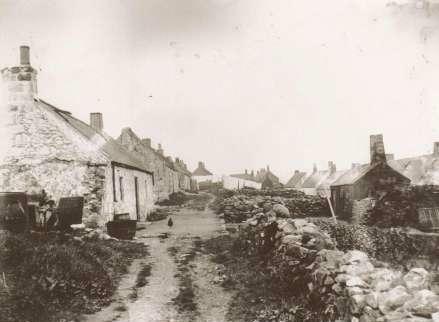 As this reality set in, some of the independent fishers from Findon, Downies and Portlethen would have realised that resistance was futile and they upped sticks and moved to the larger fishing towns, possibly suffering the degradation of signing on as hired deckhands on steam trawlers after many years of freedom and working for themselves. Today, there are no boats and no fishers who make a living out of the white fishing in Findon, Portlethen or Downies. A few boats still lie at Portlethen shore today and these boats, including my own family boat, make occasional forays a few hundred yards offshore in an attempt to land a few cod by hand line (ripper and flies). My father and a few others did try their hand at the “Small Line” fishing in the 1960’s and 1970’s but this was more of a part time job to supplement their wages in other lines of work. Occasionally they would encounter a decent haul of fish which they would take to market and, interestingly enough, a better price was paid for these fresh and line caught fish than for those caught by trawl net from further afield.